Bristol took a big hit in 2016 when Ball Corp. closed its 260,000-square-foot beverage packaging plant, eliminating 230 jobs. That facility, however, now has a new owner who plans to create 405 manufacturing jobs. The Bristol plant now is owned by American Merchant, a newly formed company that is a subsidiary of Hong Kong-based Merchant House International Ltd. Merchant House makes home textiles, seasonal décor products and leather shoes. 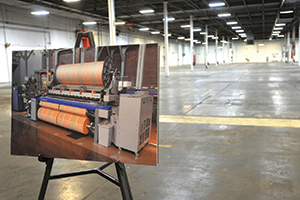 American Merchant is investing $19.9 million to convert the plant for the production of embroidered hand and bath towels. American Merchant’s equipment should start arriving in March. “They are estimating six to eight months for the upfit to be ready for production,” Poe says. The company is ready to start hiring and training employees. “We’ve not had textiles in Bristol for a while, and we’re looking forward to this,” Poe says. During the site selection process, Bristol competed with sites in Arkansas, Florida, Mississippi, North Carolina, Rhode Island and South Carolina. Former Gov. Terry McAuliffe approved a $300,000 grant from the Commonwealth’s Opportunity Fund to assist the city with the project. The Virginia Tobacco Region Revitalization Commission also approved $590,000 in Tobacco Region Opportunity funds. American Merchant also is eligible to receive additional grants and state benefits from the Virginia Enterprise Zone Program and Appalachian Regional Commission, both administered by the Virginia Department of Housing and Community Development.